With the title Stages On Life’s Way, Kierkegaard gave a new phrase to many languages and offered through his delineation of aesthetic, ethical, and religious studies a tentative solution to a major conundrum of both modernist and postmodernist sensibility—the question of human identity. Both playful and serious, brilliant and dense, revealing and concealing, in no way a repetition of earlier writings but adding new insights to previously used themes, Stages On Life’s Way is an intellectual challenge, a literary imbroglio, and a provocation to Socratic self-reflection. Though the title may suggest a Bildungsroman, the volume is more an arabesque, a collection of apparently separate works followed by a commentary and interpretation of the collection by the editor. 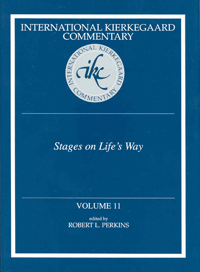 The authors of this present collection of previously unpublished essays address, analyze, praise, criticize, and puzzle over the issues of Stages On Life’s Way, its relation to the whole of Kierkegaard’s authorship, to Kierkegaard’s own life, and to the difficult task of making sense of our own selves in the various stages on life’s way.